DD5LP – March 13th. 2015 – DL/AM-180 Berndorfer Buchet. Andrew VK1NAM contacted me via email earlier in the week to ask if it would be possible for me to get out on Friday morning my time as he was looking for a second contact into the DL association to count towards his Mountain Hunter award (he already had one DL contact and just needed the second). I had already planned an activation on the Saturday from Peissenberg but gladly agreed to head out on Friday instead. As this had to be an early activation to catch the long path window I decided on my closest summit Berndorfer Buchet. I already knew the summit from activating it in 2014. Being only 30-40 minutes away from home this was the best option (or so I thought). Given the difficulty of access due to the remaining ice and snow, Peissenberg (with it’s winter bonus) would have been a better choice. Heinsight is a fine thing but I chose Berndorfer Buchet. I’ll need to try to “knock off” the easy summits with winter bonuses next week before the period ends, or leave them until December. I decided to take the 10m squid pole this time instead of the 6m one, but apart from that the usual equipment was packed up ready to go the night before. Berndorfer Buchet is in the middle of a forest on a hill overlooking the village of Paehl, just south of lake Ammersee. Probably an hour’s drive from Munich but only just over 30 minutes from where I live. This is an easy summit and as such only gives 1 point even in winter. There were a few surprises and not just the band conditions. AM-180 Berndorfer Buchet is a small hill, not very high when compared to the alps, because of this it doesn’t get a winter activator bonus. While most snow and ice has cleared around here (including on many of the lower summits that get the winter bonus points), it hadn’t from the approach (walking) track to AM-180. Luckily the last 30m vertical climb had cleared of snow otherwise I may not have got to the summit at all. What looks like snow in the pictures below, is snow with a layer of ice on top of it and where the forestry vehicles had been, it’s solid ice and very slippery! Although sunny, I doubt the temperature got over 0 degrees even in the sunshine, while I was there. As soon as I had set up, I saw a spot for Andrew and could hear him about S2 or S3 and tried calling for 20mins but I was swamped by the stronger chasers. I then spotted myself on 20m and qualified the summit with a bunch of the usual chasers.When I returned to Andrew’s frequency I couldn’t hear Andrew any more. The 20m band was not as good as it has been. I then saw an OE portable station spotted and went to see if I could get an S2S but due to the proximity (skip distance), I couldn’t hear him at all. Still hopeful of catching Andrew I went back to his frequency and thankfully, conditions were back and the wall of chasers calling had gone down in number and we managed the contact! After this I decided to go onto 40m and give a call. 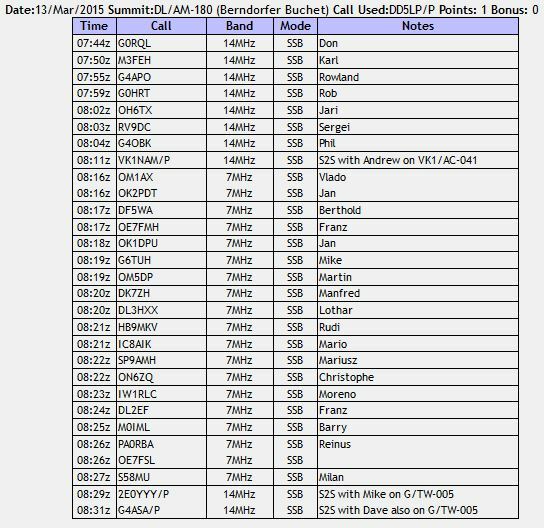 It was crazy – lots of callers most at S9+. 40m was really “popping”. Just as I was about to pack-up with bitterly cold fingers, I saw a spot on 20m for Mike (2E0YYY) and Dave (G4ASA) so called them and had an easy contact to complete the activation. Just beacuse most of the area is cleared of snow, do not assume that the summit you want to activate is! I raved in the last activation report about the clip-on spikes for my boots and how valuable they are. I needed themon this activation but left them at home!